Several weeks ago Pyramydair sent us the new Air Arms S510xs Ultimate Sporter in .25 to be able to field review. This rifle is one of the hot picks of 2019 so I was very excited to get a chance to field use this awesome rifle. I received the rifle and was very pleased with the packing of it in a very well formed shipping box. The S510xs comes in several stock options, I had chosen the walnut 288cc version in .25 caliber. Air Arms has done a beautiful job with the fit and finish of this sporter, beautiful natural looking wood. The rifle included two 10 shot magazines, T-Bar fill probe as well as some allen wrenches for adjustments to the stock and trigger. The Ultimate Sporter XS Xtra takes Air Arms’ most prized PCP and adds even more value to a platform already at the height of its powers. With an introduction of a fully-regulated system, the Air Arms S510 XS is the S510 action perfected, with more shots per fill than ever before. This variant features a finely crafted Walnut stock, with luxurious etching that reflects Air Arms dedication to traditional craftsmanship. This XS’s precision checkering on the grip and forend, fine curves and grooved handholds make this PCP a worthy mantlepiece. The Minelli stock comes complete with an adjustable, soft-touch coated cheekpiece, adjustable buttpad, integrated sling mounts, and an accessory rail ready to accept bipods or even a palm shelf. 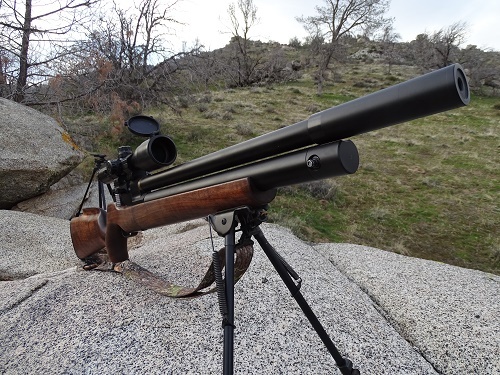 Customers requested a regulated S510 and Air Arms delivered, all while boosting the power of the increasingly popular .25 caliber. With this regulated upgrade, the XS can achieve a whopping 44 ft-lbs in .25, 32 ft-lbs in .22 and 20 ft-lbs in .177. Power isn’t the only thing increasing in the XS. The XS regulator offers increased consistency and shot counts from the 288cc cylinder, delivering an impressive 60 (.177), 55 (.22) and 40 (.25) shots per fill with minimal velocity change. These long shot strings are further aided by a built-in power adjuster. Each XS Xtra features the prized Lothar Walther barrel, which gives this platform its renowned accuracy. Each rifle includes 2 of Air Arms perfected 10-shot indexing magazines, smooth side-lever cocking mechanism and an easy to read built-in manometer. The Air Arms Ultimate Sporter platform has turned heads at the range since 2013 with shots so accurate they require a double-take. If you want the longest, most consistent shot strings with surgical accuracy, join the elite ranks of Air Arms airgunners with S510 Ultimate Sporter XS Xtra. After a full inspection of the rifles function and making sure everything was tight I mounted a Hawke Vantage 3-12X44 SF Scope. This is a great scope for the money that I believe to be a good step up from the standard AO Vantage. This model has the Side Focus that works much better in the field for quicker adjustments. With the Hawke Sport Optics Vantage Side Focus Rifle Scope you’ll enjoy both close and long-range shooting. The unique 1/2 Mil Dot reticle offers several aim points for those times when you need to hold over or under. All the power you need for your most accurate shooting is built into this scope with its side focus control, low profile MOA turrets, and convenient side focus operation. Ater mounting the scope I took a look at the T-Bar fill probe, this is Air Arms standard adaptor that I personally don’t like. The reason I don’t like any type of probes or adaptors beyond standard fosters is the get lost easily and are reliant on several O-rings. To fill this gun using a standard foster fitting an Air Venturi adaptor will be needed. This model has the 288cc air reservoir that fills to 250 BAR or 3600psi. The Air Arms is fully shrouded and is able to be fitted with several different types of moderators to quiet the bark. The end cap is threaded for a 1/2×20 male, I have chosen a DonnyFL Tatsu moderator as these have worked well on my other rifles and are of great build quality. The side lever on this gun is of excellent quality, easily opens and closes with one finger. Really smooth and easy to use, very well done and looked very durable. On the right side of the rifle is the power adjuster knob that has five increments “clicks” for fine tuning the power levels or consuming of air. On the left side of the rifle is where you can see the adjustments with a small bar with +/- symbols. I personally don’t see myself using this feature and would most likely always have the setting to maximum power levels. Next we look at the safety that is of a simple crossbolt design, I don’t really like the placement as it’s not able to be put on easily with my index finger. The Air Arms is fully shrouded and one thing to note is it is vented, I mention this because for those not familiar with a vented design. A shroud with vents will expel air and can sometimes be felt by the shooter, this is totally normal to a true shroud design. The Air Arms is fitted with a fully adjustable Cheek piece as well as an accessory rail under the forearm with built in adjustable sling mount. 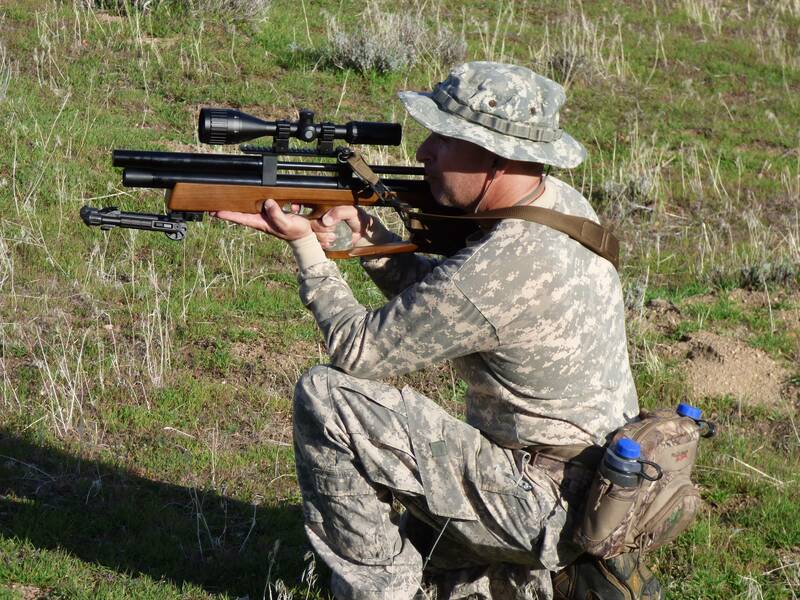 This is a great feature that allows the rifle to be set up comfortably to the individual. 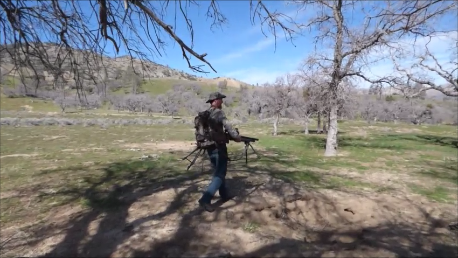 I mounted a Benjamin tactical type bipod that extends out to 7.9″ and works well from bench to field. The following day was spent at the 50/100 yard private shooting facility, the weather would hopefully cooperate. I first set up at 50 yards where I spent some time sighting in the new Hawke Vantage scope. The rifle came with two 10 shot rotary magazines that in my opinion are very reliable due to having no “spring” inside. Air Arms has incorporated a mechanism on the rifle itself to advance the magazine. These magazines are very easy to load and very friendly to leave loaded and field carry. I had brought several types of pellets but found the .25 JSB Match Diabolo 25.39gr domed pellets worked very well. 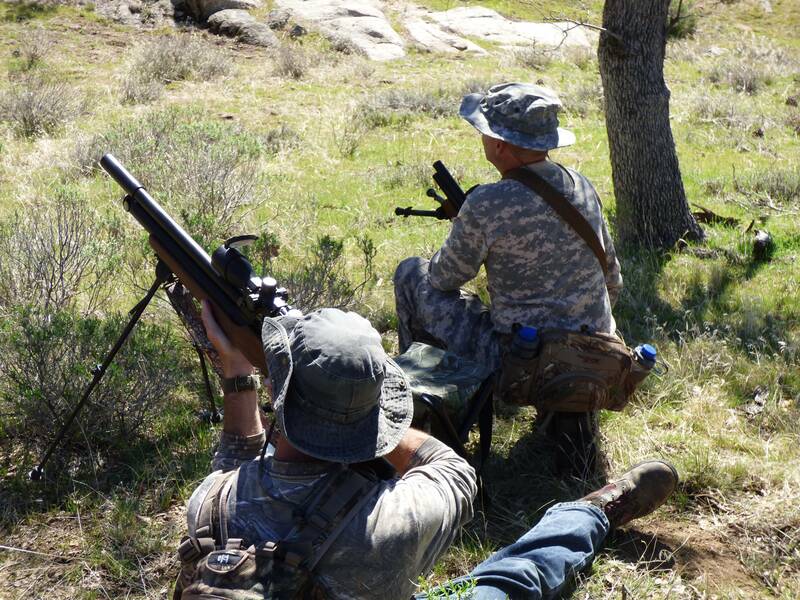 Air Arms has done a great job with the ergonomics of the rifle to work very well from the bench. The large 288cc air reservoir gives 32 regulated shots at 44 fpe, a very conservative shot count. The trigger is fully adjustable but was very pleased with it’s set right out of the box, smooth and predictable. After spending some time shooting the rifle and sighting it in I shot several groups at 50 yards, all very good. This S510xs .25’s regulator works very well to keep the accuracy very consistent, the gun shoots far better than I can. We moved along to the 100 yard range where unfortunately I would need to contend with some wind. I was actually kind of happy to be able to practice with some wind as the area I would be hunting is frequently very windy. Filming in the wind is never fun and makes it difficult to keep the video smooth and shake free. I shot several groups that fared very well so decided to go for the gold and shoot a 20 shot group. To put it simply, this gun is “ACCURATE”!!! The Air Arms S510xs definitely shoots well and no doubt the regulator and LW barrel are a great combination to the rifle. A 20 shot group like this at 100 yard no doubt puts a smile on my face, can’t wait to get this into the field for some hunting. My initial thought was that 44fpe really isn’t much power for a .25 caliber Airgun here in the United States, this power level however works very well for it. The weather here in CA had been very poor the past several weeks so getting outside was hit or miss with the rain storms. 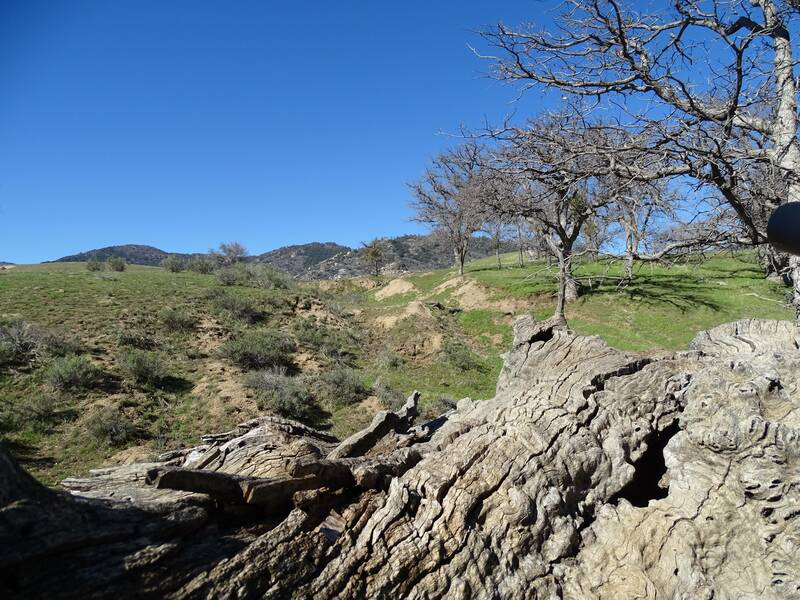 The following week Marley and I headed several hours North to a familiar location where I have spent much time hunting the California Ground Squirrel. 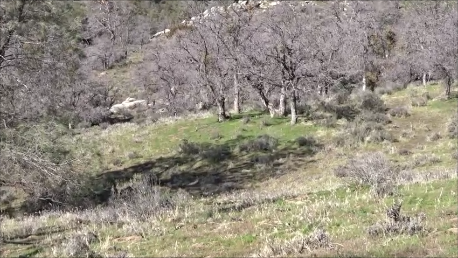 This terrain is one of my favorite areas and offers near perfect habitat for these varmints. 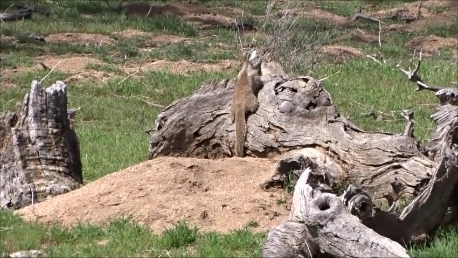 The weather here has been poor and the temperature and rain has kept many of the ground squirrels inside their holes. We arrived to find some snow still on the ground as well as the temperature being about 44 degrees at 6:00am. The morning was a bit cold but nonetheless very beautiful and green after having some much needed rain. I unpacked the rifle and aired up for a full day of field use! The area we would be hunting first was a bit of a hike into some thick forest that had many fallen trees and a hillside with many rocks and logs. By this time it was still cold but the sun was starting to warm us up as we set up behind a large fallen tree. It didn’t take long for us to spot several of our first victims moving around out past 70+ yards. 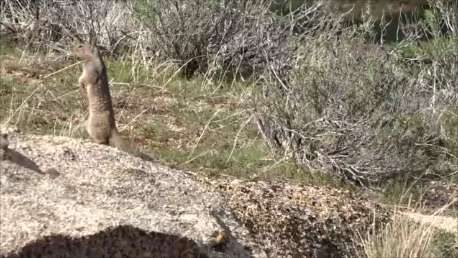 This Ground Squirrel went down with authority sending the THWAAACK echoing through the canyon. The Air Arms works very well for offhand shooting and the adjustable cheek is an added bonus for comfort. The texture on the beautiful walnut stock makes for exceptional grip in a variety of shooting positions. Marley and I spent another hour in this spot and managed to feed some lead to 5 of them. This one I put down at 55 yards with a mean headshot!! The Hawke Vantage 3-12X44 SF scope works very well for most hunting situations, the side focus really is a step up from the standard AO model. The glass is clear and the half mil dots really help with those precision shots at longer ranges. 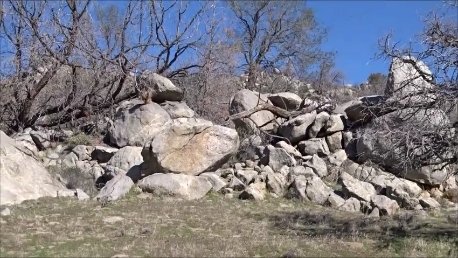 A few days later we would be hunting the same area but with a bit more wide open terrain that has several rock outcroppings and Oak tree groves. 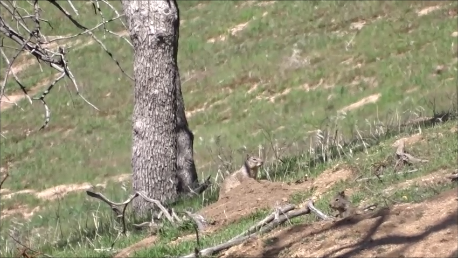 This really is one of the best natural habitats for the California Ground Squirrel. The temperature was moving up into the high 60’s with the clouds moving through pretty quickly. Marley and I found a valley that looked to be a good spot to sit in the tall grass and wait for action. 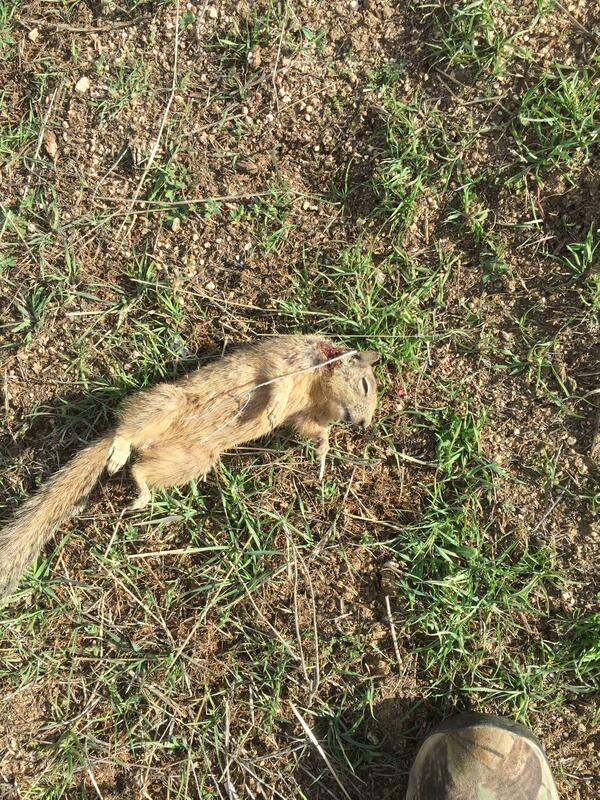 It didn’t take long to spot a few Ground Squirrels at 57 yards, this shot needed to get threaded between some branches to make a connect. THWAAACK!!! We ended up taking several in the same spot, most were lost down into the many holes that were covering the small embankments. We continued in a big loop that followed a small animal trail that eventually led us down a steep hillside. 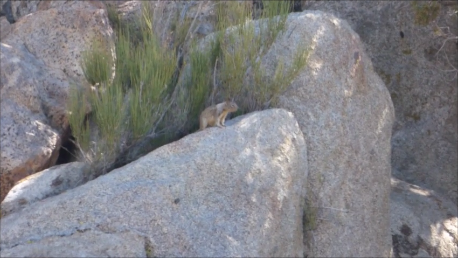 I spotted quite a few Ground Squirrels sunning themselves on a rock at 116+ yards offering several great shots. I missed on a couple of them only to have continual shots due to the fact they really couldn’t see or hear me from so far away. I made a perfect headshot on one that was sitting in a crack at 116 yards. THWAAAACK!! The Air Arms S510xs .25 is in fact one of my new favorite Airguns for field use, I love the ruggedness, accuracy and adjustability of it. After spending the rest of the day filming and taking some still photographs we were ready to head back down the mountain. 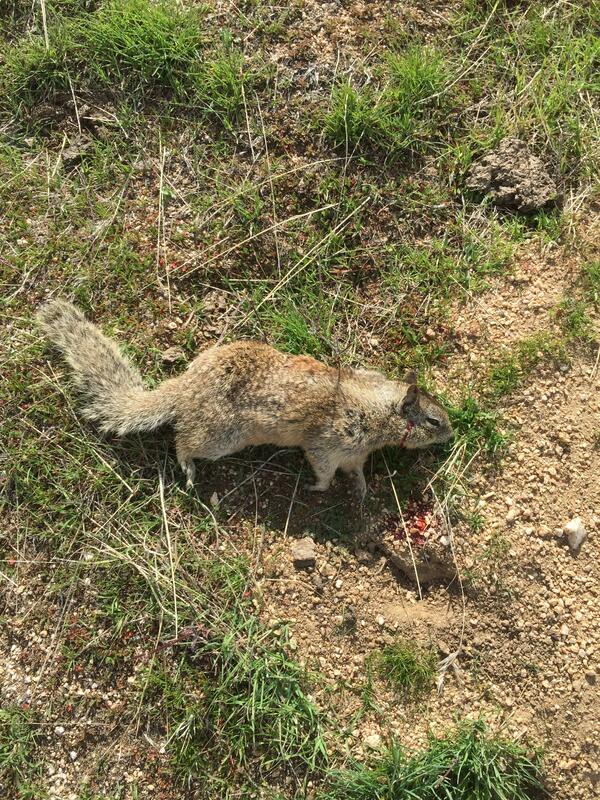 The activity was very slow but still managed a successful trophy Ground Squirrel hunt. I really enjoyed making this review and hope that it might help those of you who are interested. If you would like to purchase this rifle it’s available for order through Pyramydair with the provided link. 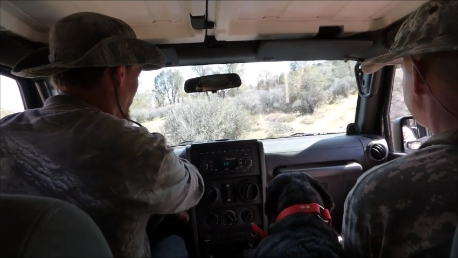 Thursday afternoon I started packing the Jeep for a three day adventure with my dog Marley and several hunting buddies. Friday morning at 2:45 am Marley and I headed several hours North to a location that we have been frequenting for several years now. 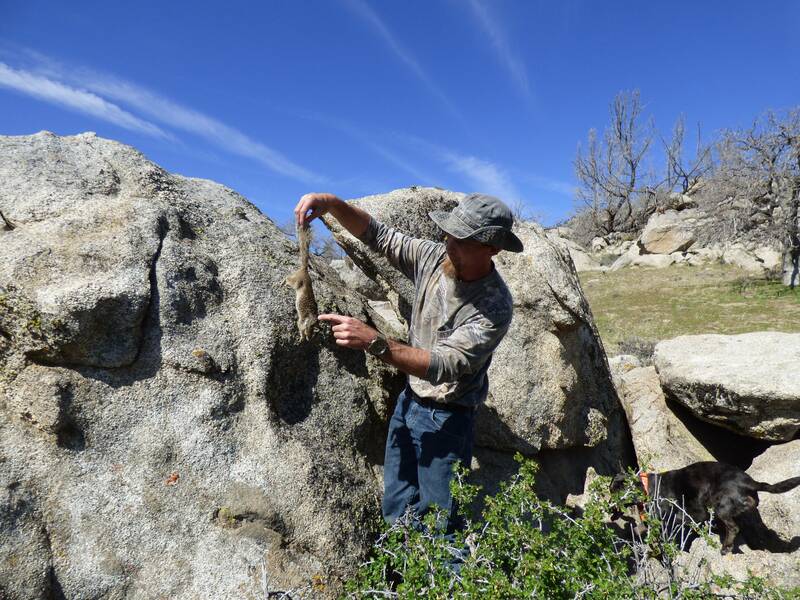 The area is normally very secluded and offers some of the best Jackrabbit hunting the state of California has to offer. I was especially excited as the recent rainfall has created an abundance of brilliant colored wildflowers, tall green grass and near perfect weather to the area we were to be hunting. The long dirt road that heads into the hunting area is around 24 miles long and is best traveled slow, especially in the darkness of early morning. 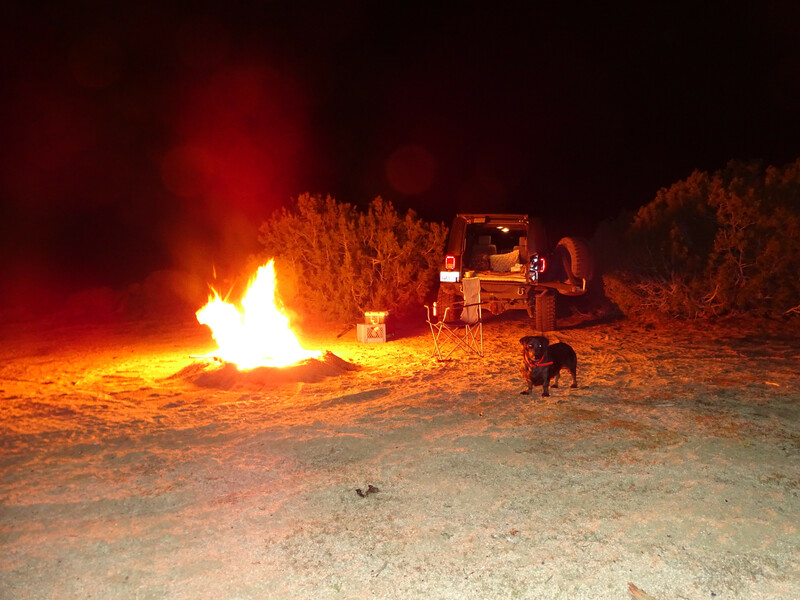 Marley and I made our way carefully down the road where we encountered Giant Kangaroo Rats, Jackrabbits, Owls and Coyotes that would occasionally make way in front of the Jeep. After some time we made our way into the campground that unfortunately was occupied to capacity by the Spring breakers making visit to spectate the wildflowers. I expected to find more than the usual amount of people, especially this time of year so we decided on plan B that was to camp on top of a mountain. The area on the mountain was not easily accessible to many vehicles, and out of the way of prying eyes as I prefer most of my camping excursions to be. Marley could hardly wait to get out and stretch her little legs and take in the fresh morning air. I pulled out a folding chair, cracked open an iced coffee and sat to enjoy the stars and quietness of the morning. After several minutes I noticed Marley staring at something and acting strange, I picked her up and put her in the truck not wanting an altercation with animals. I pulled out my flashlight and spotted the glowing eyes of several tiny kit foxes that were curiously watching us from a distance. These foxes are actually very rare to the area and considered to be endangered and highly protected. As the morning progressed by this time it was near 6:00 am and time to start unpacking the gear and readying myself for a long day of hunting. I was using my larger pack that carries a good amount of water for both Marley and I, still leaving room for camera equipment and ammo. 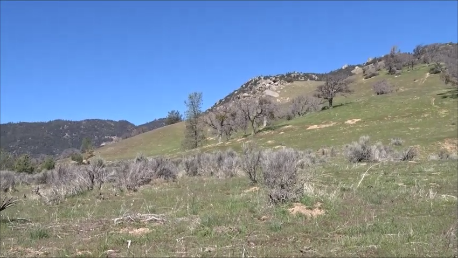 The plan was to hike about 45 minutes North into the mountains where I had some good experiences hunting Jackrabbits several times before. As we made our way from the Jeep we had to crawl under a bob-wire fence that proved easy for Marley and quite the challenge for me, rifle and pack full of camera gear. 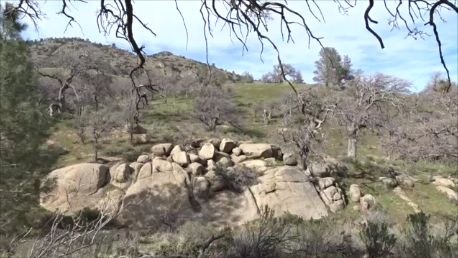 From this point the hillside moves up to a sharp rocky incline with tall grass and patches of thick brush that makes it a difficult hike, especially with low light. As Marley and I reached the top of the mountain it was approaching sunrise that quickly showed off our beautiful surroundings of tall grasses and brilliant wildflowers. 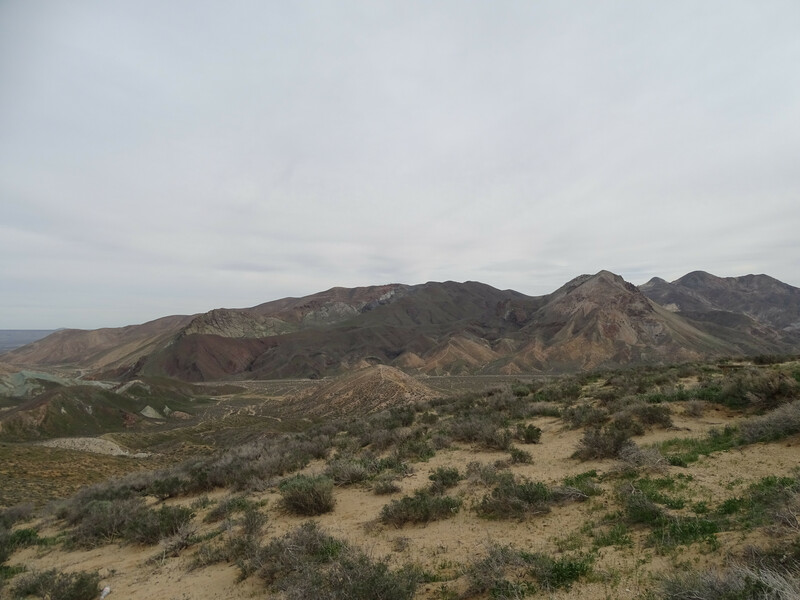 We hiked for a few more minutes until we came to an area that looked across a canyon where I was sure we could spot some moving Jackrabbits making way around the hillsides. We sat and waited and soon I was able to spot a juvenile sitting in a small clearing surrounded by thick brush and tall grass. My American Air Arms EVOL .30 had recently been upgraded with a Hawke Frontier 2.5-15×50 riflescope that has made it much more enjoyable to hunt long range. I mention this scope because through much experience I have found the importance of clear glass coupled with a nice wide field of view. 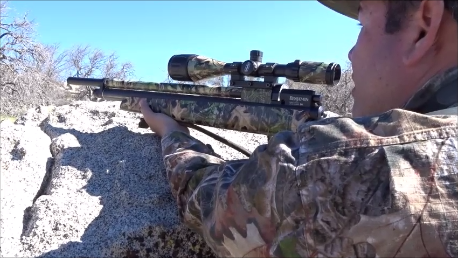 This scope has drastically improved my hunting in just the short time I’ve had it and seems to fit the gun very well. Back to the hunt, as mentioned I spotted a juvenile size Jackrabbit that at first can be mistaken for a Cottontail other than the ears. From my position I was right near 140 yards with a good strong wind blowing from left to right making it the perfect kind of shot for the .30 44 grain Predator Polymag. I took several minutes setting up my camera and adjusting the friction head to zoom in to capture the shot on film, always kind of a pain to set up considering the range and several bushes obscuring the view. 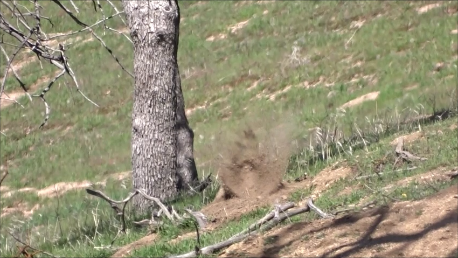 After the camera was rolling I made the shot that sent the jackrabbit flying backwards about a foot where it instantly expired. Marley was quick to retrieve and was as excited as I was to make our first kill of the day. After a short break Marley and I continued into the expansive back-country where we continued to spot Jackrabbit ears moving through the tall luscious green grass. By this time it was about 7:30 am with the wind becoming a bit stronger unfortunately, ultimately being the downfall of the hunt here. We soon came up on a deep narrow canyon that I knew must have had several Jackrabbits hiding in the bottom that went down about 100 yards. As Marley and I approached the edge looking down our presence immediately flushed several large Jackrabbits up the other side making a shot on one that was a near miss. As we slowly walked South down the ridge of the mountain I kept looking down towards the bottom of the ravine where I soon spotted a good size Jackrabbit sitting still. I sat down and tried my best adjusting the camera but unfortunately had the tripod adjusted way to low to capture any good film of the shot that was taken at 65 yards. 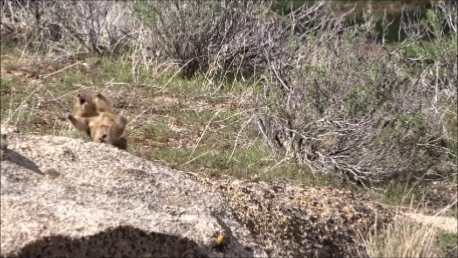 I was able to make a great head-shot that send the Jackrabbit rolling several feet down into the bottom of the ravine. 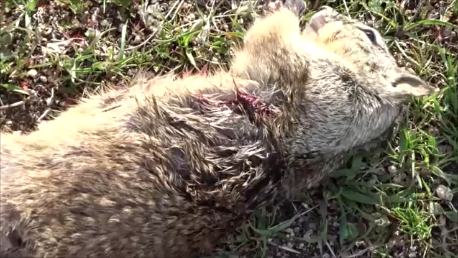 The .30 44 grain Polymags work very well for this type of small game hunting and in most cases are devastating as the exit wounds are huge. 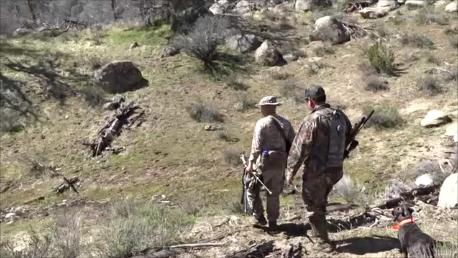 As we collected our Jackrabbit kill we continued down the ravine still heading South, back to the Jeep’s location. As Marley and I reached the bottom of the mountain we came to an enormous open field with grass that was over waist high, not easy walking for Marley legs or mine. 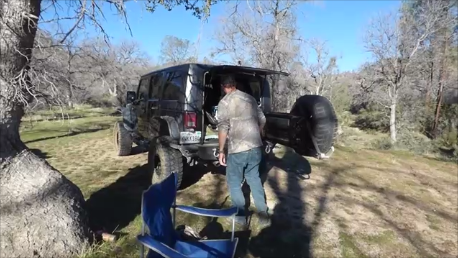 We decided to take a much needed break and to replenish ourselves with some water and a small snack to get us some energy to make our way back to the Jeep. The time was now close to 11:00 am and we were both exhausted, I was feeling bad for Marley having to make her way through such high grass. We had about 4 miles to hike before we finally made it back to the Jeep where all I wanted to do was lay down, rest and have a nice cold CocaCola. My legs were beat and after having my lunch was ready to take a nap for several hours with the hopes that the wind would die down and to charge my camera for some more filming. Marley and I fell asleep in the back of the Jeep for about an hour until I was awoken by her barking and someone grabbing my boot, not a pleasant way to get woken up. I woke up in a daze with a park ranger standing at the end of my tailgate. The ranger stated that I was not able to park in my existing location overnight and too that I was not to be parked off of the road. I had stated that I simply was waiting for several friends and that we had planned to camp several more days, the “campground” was full. The ranger was simply doing his job and can certainly respect that, just wish he could have been more sympathetic and helpful towards finding a better alternative. 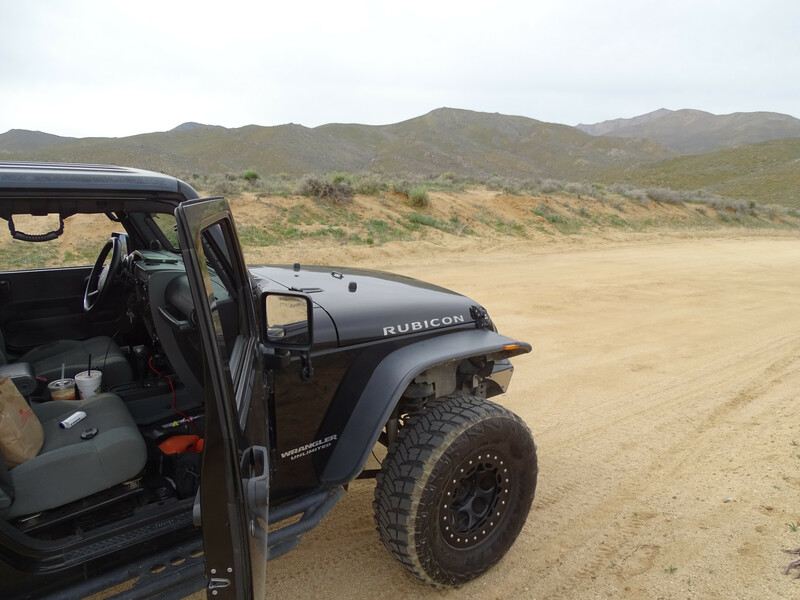 Marley and I packed up the Jeep and made our way to several other locations that unfortunately were not as secluded and too were full of the unwanted presence of “City Campers”. Call me selfish but I refuse to travel hours only to have to share space with strangers when I simply want to get away from people. After some amount of time driving back and fourth the long dirt road I decided that it may be the best decision to just leave the park all together and to call the guys and tell them. As I made way to the highway I finally had enough cellphone signal to call Terry and SteveO and let them know what had happen and to not plan to meet at that location. 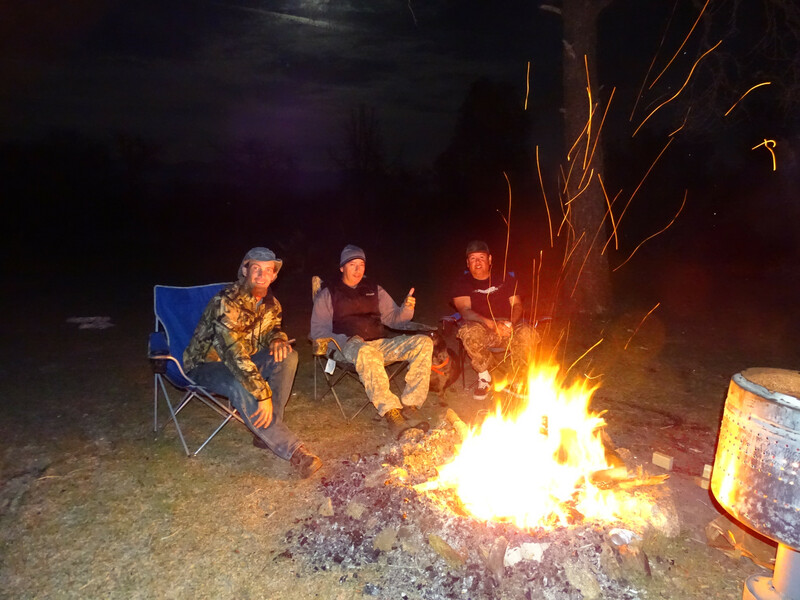 Over the phone we had decided to move our hunt to another area about 45 minutes South into the high desert where we had spent many previous hunting trips. After a short drive with a short stop through the nearby drive-thru we were at our new location, by this time it was about 4:45 pm. Marley was excited as soon as we drove off the highway and onto the dirt as this is her favorite location to hunt and was just happy to not be going home. The windows were down and both of us were happily gazing from side to side looking for any movement under the many Joshua Trees that horde the area. We arrived to where we normally camp and target shoot, a nice little cubby that is surrounded by many large Joshua Trees. 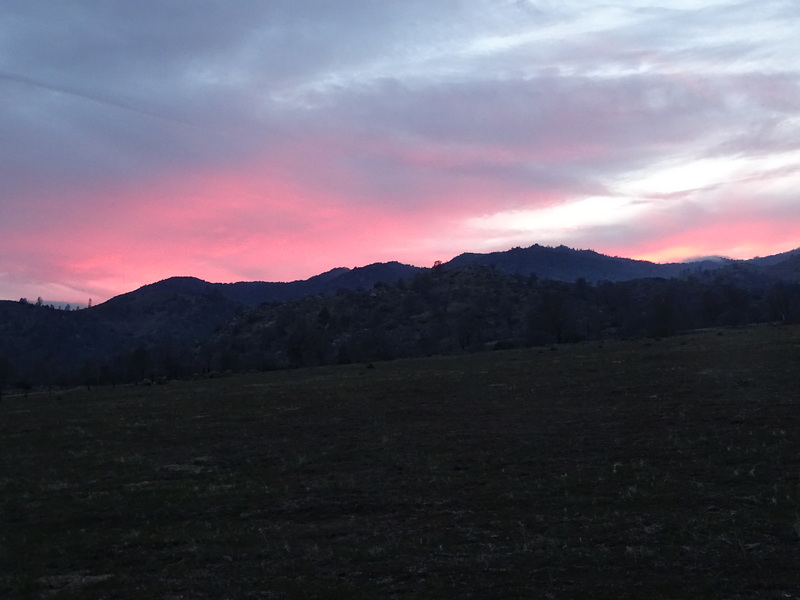 Marley and I quickly unpacked the Jeep and readied the gear along with my rifle, just in time for an evening hunt. 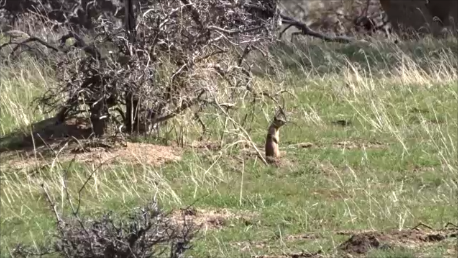 This area has a very large population of Jackrabbits, Coyotes and Ground Squirrel’s that never seem to diminish. 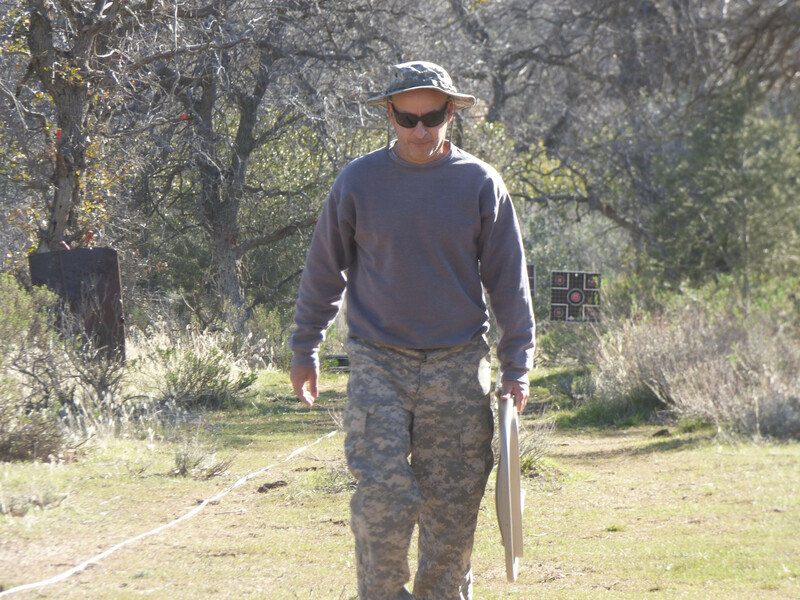 We walked a large one mile circle that I have walked hundreds of times before, almost knowing every square inch of the entire area and where most likely to find Jackrabbits. 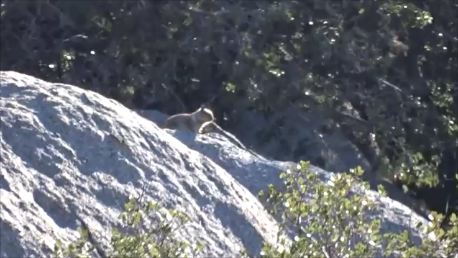 After about 20 minutes of walking I spotted several at around 100 yards that were unfortunately partially obscured by Joshua Tree branches. Marley and I slowly made our way that direction, stopping frequently with light steps to not make any noise. The wind wasn’t bad but was by no means the perfect hunting weather. From previous experience I have always had good luck with hunting in the wind as I believe the wind noise makes stalking in close easier. I can remember several times where I have gotten within several yards of a Jackrabbit without them even noticing my presence, both times were windy conditions. We eventually got close to where the two Jackrabbits were sitting but through looking all over couldn’t find and sign of them, they vanished. As Marley and I made our way through the giant circle and back towards the Jeep I spotted some ears at 70 or so yards sticking up from behind some grass. 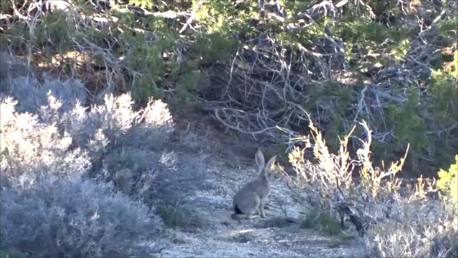 We moved what must have been two steps before the Jackrabbit stood up to where I could see its head in full view, THWAP! right in the head. Marley excitedly was off like a bolt of lightning to collect our kill and to drag it out of the tall grass. As the time was now late evening and soon to be dark we made way back to our homestead for the night that surprisingly wasn’t as cold as I anticipated it to be. I made myself a sandwich and gave Marley her dinner along with a strip of bacon for desert followed by a bit of reading before falling asleep. Both Marley and I were extremely tired from a long day of driving and hiking, my legs, feet and back were killing me. I set my alarm for 6:30 am and had expected Terry and SteveO to arrive shortly after, just in time for the morning amber ears. After a great nights sleep with a short rainstorm, just enough to wash the crud off my jeep Marley and I were awake and ready for another day. The sunrise was amazing as it highlighted all the green foliage and too made the distant fog that lingered over the nearby mountain range spectacular. This area really is one of my favorites and could hardly wait to enjoy it with my two good friends over the next two days. 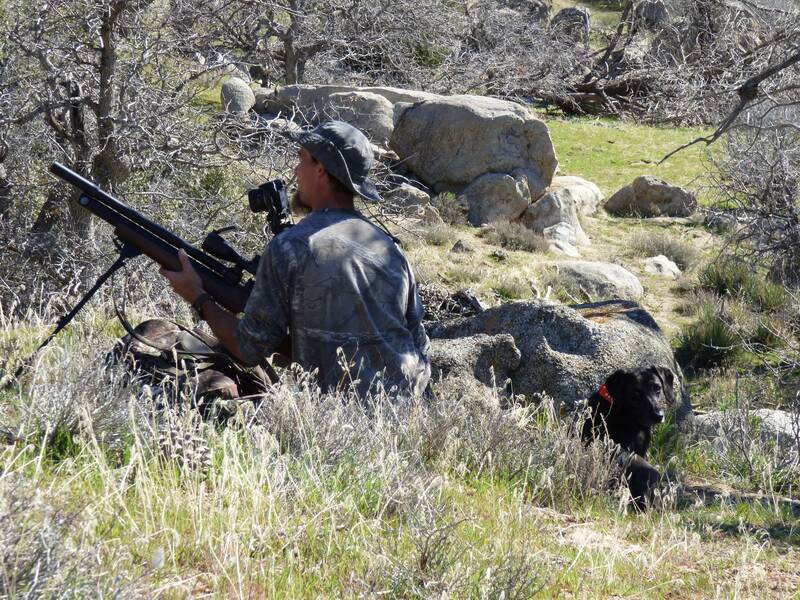 Marley and I lingered around the camp for a bit while we waited for the guys to arrive, of coarse we saw a few Jackrabbits before we had the chance to pull the rifle out. 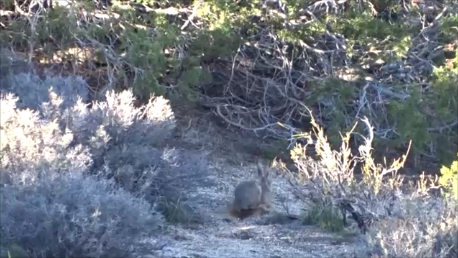 We unloaded the rifle from the truck and did a quick loop where we spotted several Jackrabbits,I set up the camera on one to film the shot but in unfortunately wouldn’t stay still long enough. As Marley and I headed back we could hear the sound of two vehicles approaching in the distance. SteveO and Terry had made it and Marley became very excited as these two guys are her favorite and have become family to her. I was happy to have both these guys join me as the past day had not been very productive considering the problem with the wind and lack of place to camp. 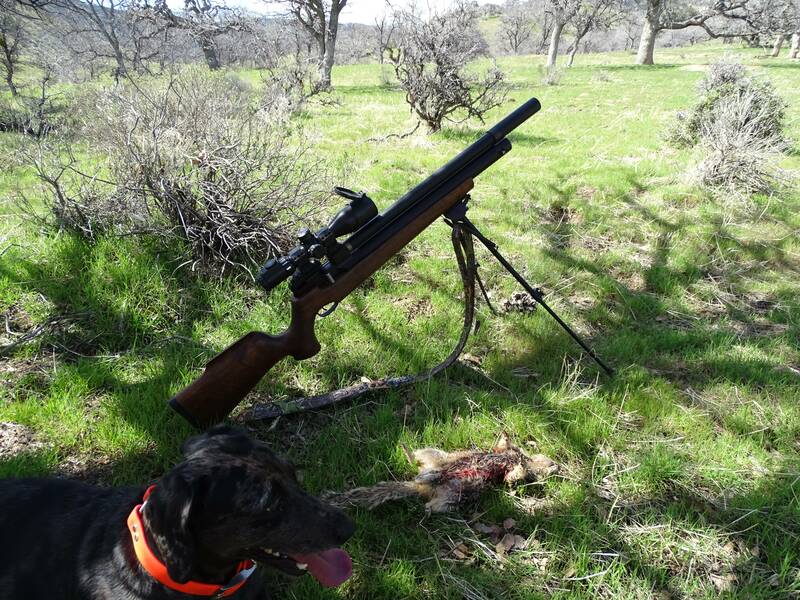 Terry had brought his trusted Tapian Mutant that has proven to be a great hunting gun being laser accurate and extremely efficient with shot count. SteveO had brought his old trusty .25 Marauder that has had many successful hunting adventures ingrained into it. After a few minutes of them getting the guns aired up and gear situated we headed off with me following close behind with the camera. 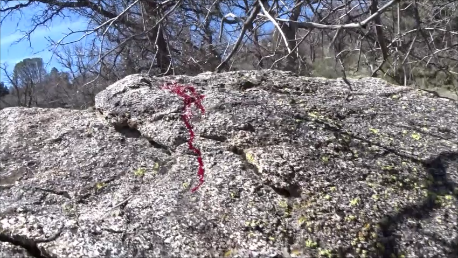 I had really hoped to capture some good hunting footage that could be used in some future videos and thought this may be a great opportunity. Marley didn’t want to miss the action so she made sure to stay close to the guys, just in case her services were needed. We made our way through the jungle of Joshua Trees hoping to find the peachy glow of amber ears being back-lit by the morning sun. Terry spotted one that moved off like a flash through the thick Springtime foliage that made them extremely difficult to spot. 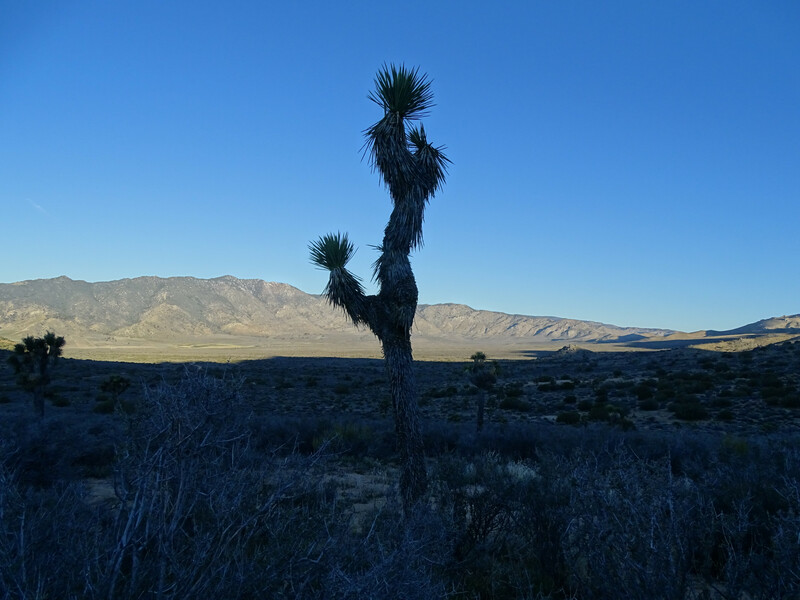 I had suggested they move towards an area that had less Joshua trees and was a bit more wide open with several small hills that may hold several. Slowly we made our way out of the wall of Joshua Trees and into the field I described, almost immediately met by several Jackrabbits. 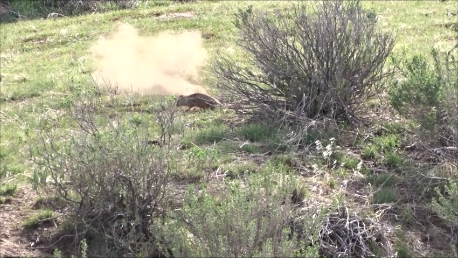 This Jackrabbit is a prime example of how difficult it is to judge range in some cases due to hills and obstacles, this one was at 100 yards but the illusion made it look much further. We did not range properly and unfortunately were putting way to much holdover on the shots that were going way over the Jackrabbits head. The Jackrabbit amazingly enough stuck around just long enough for us to figure out what was wrong but not long enough to make a kill. This is the type of thing that can sometimes be very frustrating for any hunter, a lesson learned is always worth the mistake made I think. We continued on and tried our best to ignore the wind that seemed to be coming about very strongly. SteveO and I took a break while Terry spent some time stalking a Jackrabbit that was moving back down through the Joshua Trees. I don’t think any of really cared much about success to much, we were just happy to be out and about with good friends. Marley was enjoying the area as well, smelling all the smells and chasing lizards, birds and tiny Golden Mantle Squirrels. As SteveO and I were walking we both noticed a very beautiful Quail that was perched on a nearby Joshua Tree, this area had many. The wind was becoming honestly a bit unbearable and by this time it was only 11:30 am, didn’t seem to be getting much better. 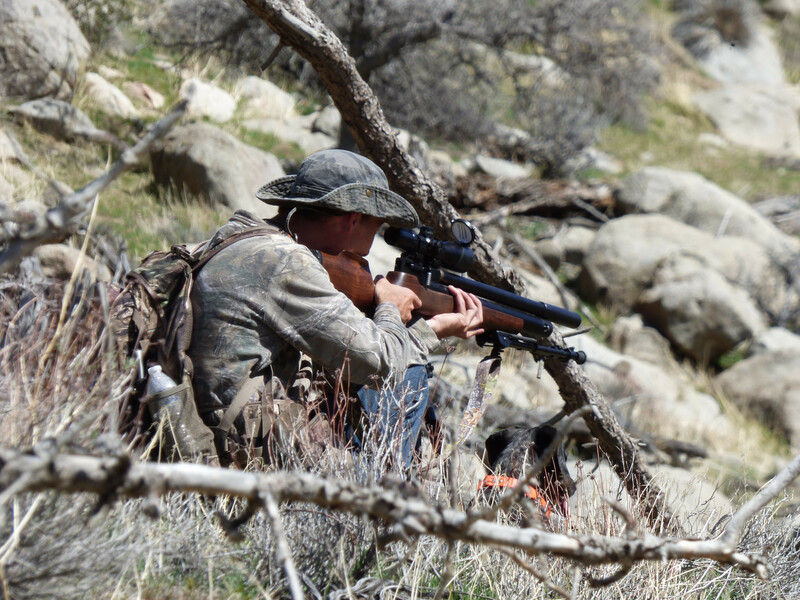 We continued hunting and spread out about 30 yards apart as we headed through the thick Joshua Trees, hoping to flush a Jackrabbit in front of us. 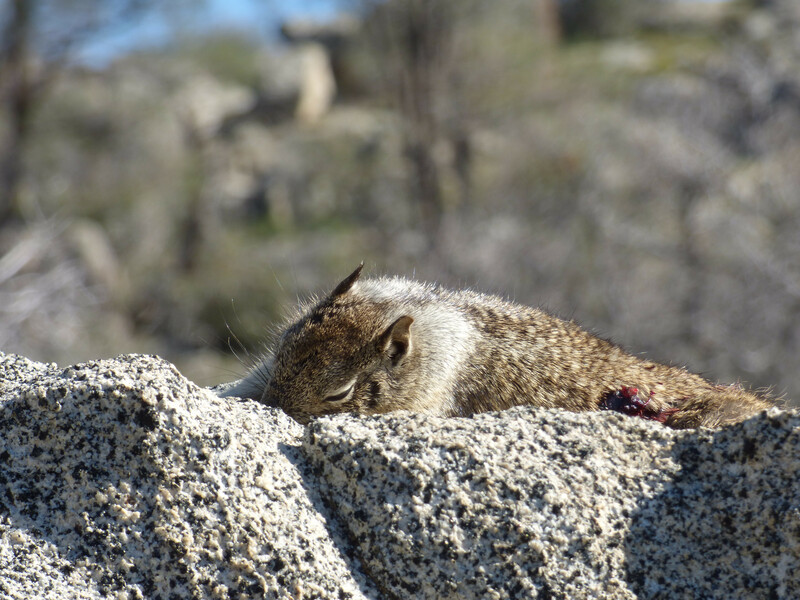 As we finally made it back to camp we noticed several Ground Squirrels that scurried off some fallen branches and back into the many holes at the base of the Joshua Trees. After a short break at camp we decided to head over and wait for the Ground Squirrels to make another appearance, long enough to make a shot. 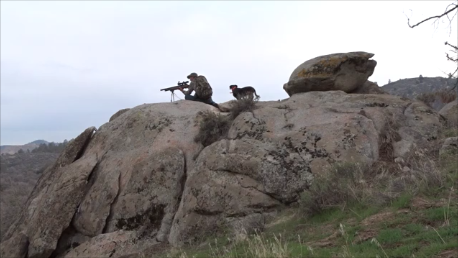 All three of us were set up at within 30 yards of the nearest Ground Squirrel hole, the wind was blowing about 45/50 mph by this time. 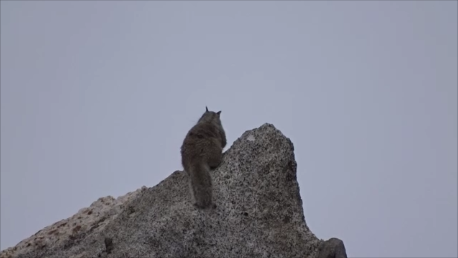 When the wind is blowing that hard we had guessed it most likely detours the ground squirrel activity, making them stay down and out of the wind and flying debris. All of us sat patiently for quite some time, only to have nothing but sand blown in our face. The wind was at this point so bad that it made it difficult to walk without getting blown over, not to great for hunting either. After some time visiting we decided to call it a day and head home and made plans to head out again when time allows.